Make acorns cozy! 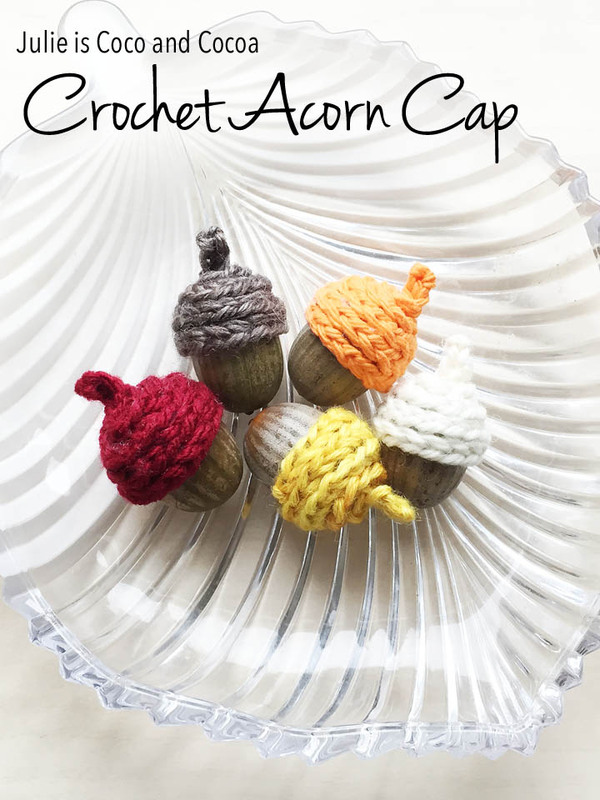 This fall stitch up a quick Crochet Acorn Cap. Leaves aren’t the only thing falling right now. Acorns are aplenty all around where we live. We have a few different types of acorns where I live, ranging in size and color. I picked up these medium size acorns that have a slight stripe on them when I picked up Littlest from school this week. It seems that most often when I spot an acorn it’s either the acorn cap or the acorn nut. It’s less common to find an entire acorn together. 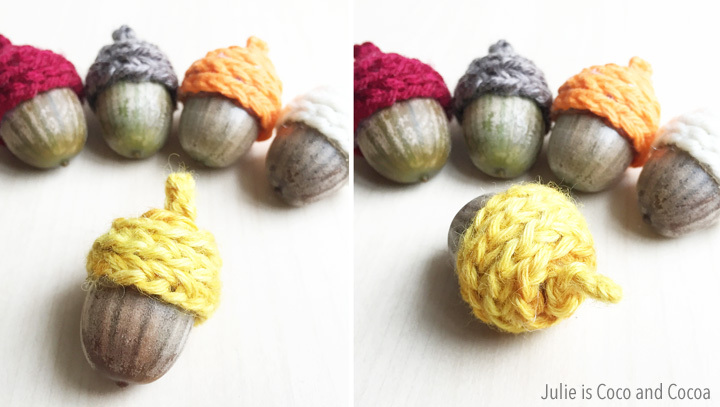 I decided that these cap-less acorns could use an upgrade, in the form of a Crochet Acorn Cap. 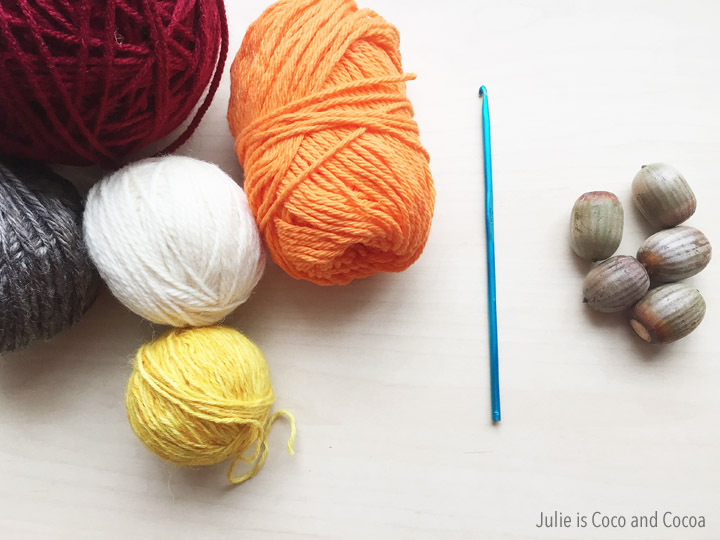 I pulled a few fall colored yarns out of my stash and a size F (3.75mm) crochet hook. Then it was simply making a chain stitch, no other crochet stitches required. I crocheted about 60 chain stitches and then left a loop at the end. The exact number of chain stitches I needed varied slightly by acorn. Starting in the middle-ish I hot glued the chain stitch to the acorn, working in a loop and moving towards the top of the acorn. I left a small amount of chain stitch sticking up from the top like a stem. To finish it off I knotted the end of the chain stitch, trimmed it, and added another drop of hot glue. Looking for some other acorn crafts? 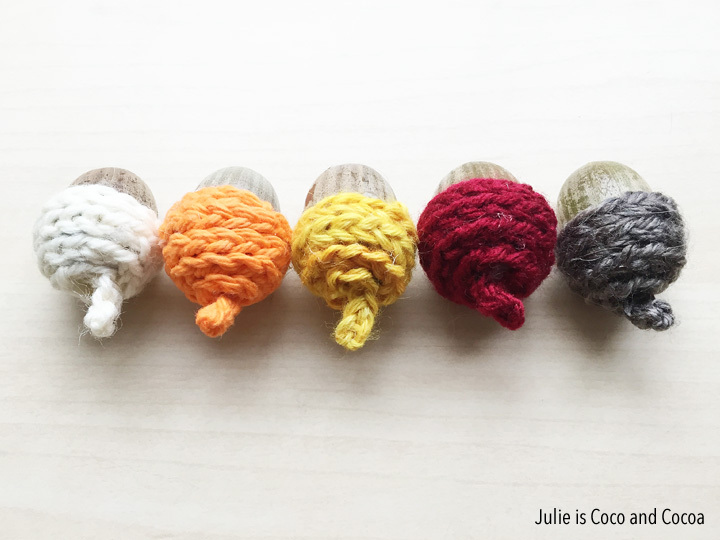 Try these simple Jeweled Acorn Caps. So adorable, thanks so much for sharing on craft schooling sunday! This really makes me want to learn how to crochet, they turned out lovely!! This is one of those things that makes no sense why you would need it yet you NEED it once you see it! So cute! These are so cute- this makes me miss crocheting! So adorable! I *still* haven’t learned how to crochet…maybe I’ll make that a New Year’s resolution. 🙂 Thank you so, so much for partying with us at Snickerdoodle Sunday- can’t wait to see what you’ve got next this weekend! What a cute idea! I never would have thought of this! Thanks so much for sharing at Share The Wealth Sunday!!! So cute!! 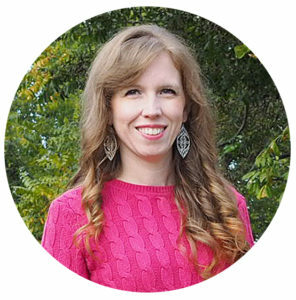 I would love to have you share at my new link party: http://craftymomsshare.blogspot.com/2015/11/crafty-weekends-half-yard-christmas.html. 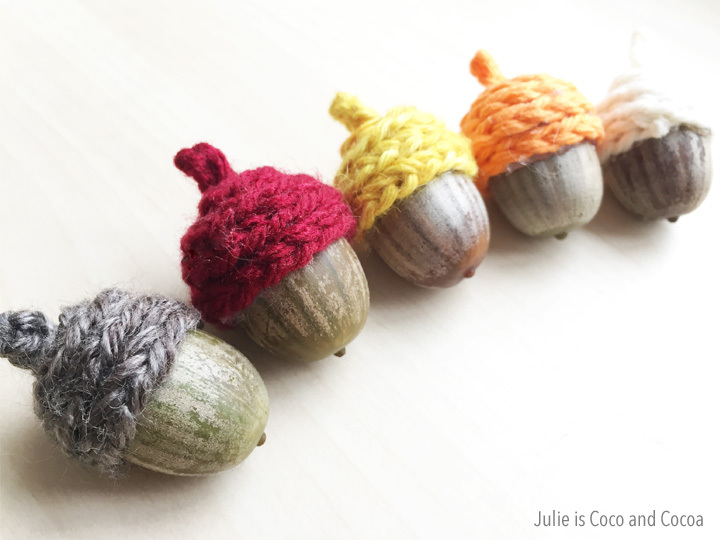 Julie, I love your project – those capped acorns are just SO adorable! Thank you for sharing your talents at Inspire ME Monday at Create With Joy. These are so cute! 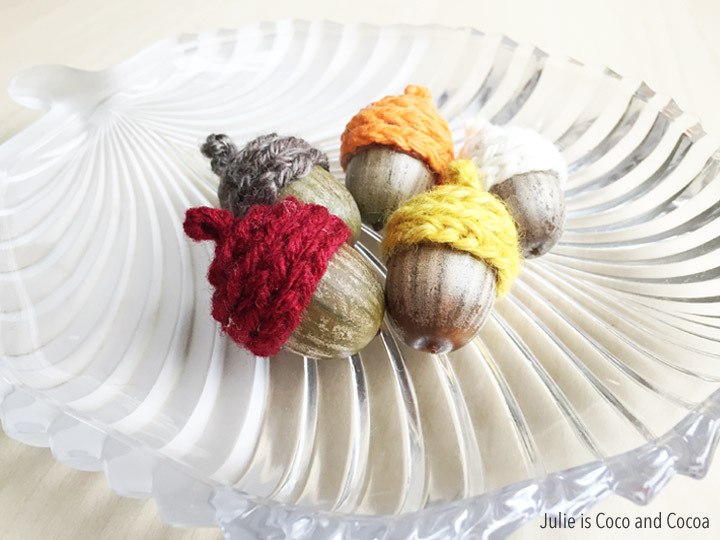 I have so many acorns that are missing their tops, and this is a great way to display them! They look so cozy and perfect for fall! These looks so adorable. Thank you for linking up with us @ #HomeMattersParty. We would love to have you again next week. What a cute idea. Thanks for sharing at #Throwback Thursday. Please join us again and remember this week will focus on Thanksgiving recipes. How adorable! Now should I tell you my story of how I bought a bag of acorns to dump in the bottom of my big candle jar – and thought they were real. Until someone pointed out to me they weren’t. And then I argued with them…until we pulled out the candle and base and I realized they were indeed faux acorns. Regardless a few of these would be darling sprinkled here and there amongst them. Thanks for sharing on Throwback Thursday! I can’t even! These are two cute!!!! This is so cute! They would make a great addition to the Thanksgiving table. Great idea!